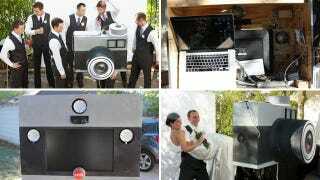 Instead of having an obnoxious wedding photographer trying to grab candid shots of the guests during the reception, Instructables user letMeBeFranks built this gigantic Lomo that served as a private photobooth. At $150, constructed from scrounged parts and equipment from around his home, it was a lot cheaper than renting one too. On the outside the booth was designed to look like a giant Lomo camera so guests immediately knew what it was for. And the use of a Staples' big red Easy button for the shutter also ensured that anyone could easily operate it. A set of three Ikea halogen lights provided plenty of illumination, while on the inside a MacBook connected to a visible external monitor served up instant previews. The photos were captured by a Logitech webcam and sent directly to Apple's Photo Booth app, with an Arduino and some custom wiring tying all the components together.